With the presence of a large pool of participants, the global Macrolide drugs market is displaying a highly competitive business landscape, finds a new research report by Zion Market Research (ZMR). Abbott Laboratories, Akorn, Inc., Eli Lilly & Co., Fresenius Kabi USA, Gland Pharma Limited, Neo Química, Macrolide Pharmaceuticals, Mylan N.V., Pfizer, Inc., Sanofi, Merck & Co., Sandoz International GmbH, Teva Pharmaceutical Industries Ltd., and WOCKHARDT are some of the key vendors of Macrolide drugs across the world. These players are focusing aggressively on innovation, as well as on including advanced technologies in their existing products. Over the coming years, they are also expected to take up partnerships and mergers and acquisitions as their key strategy for business development, states the Macrolide drugs market study. Citing an instance, in April 2018, Macrolide Pharmaceuticals – a next-gen antibiotics firm developing Macrolide that are first-in-class with Gram-negative activities for myriad range of multi-drug resistant bacterial infections- declared a USD 20 million funding of the firm by firms such as Advent Life Sciences, Roche Ventures , Gurnet Point Capital, Novartis Venture Fund, and SR One. As estimated in this report, the global Macrolide drugs market stood at US$ 6.14 billion in 2017. Witnessing a tremendous rise during the period from 2018 to 2024, the revenue in this Macrolide drugs market is expected to reach US$ 7.66 billion by the end of the forecast period. The main products available in this Macrolide drugs market are 14-membered ring agents, 14-membered ring agents, 15-membered ring agents (Azalides), 16-membered ring agents, and Ketolides. “Rising occurrence of contagious diseases resulting in growing demand for drugs against the infections are likely to accelerate Macrolide drugs market demand over the years ahead,” says the author of this Macrolide drugs market study. 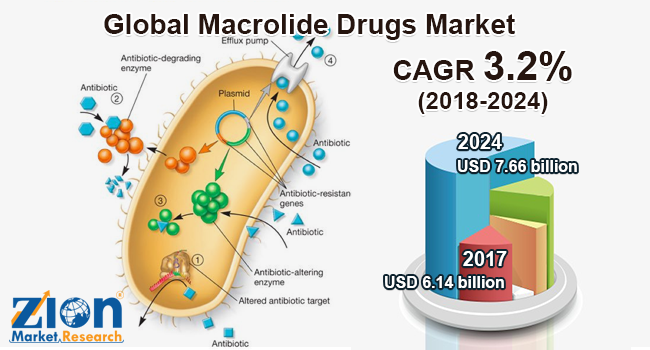 Apart from this, rising geriatric population base and the increasing rate of multi-strain resistant bacterial strains along with benefits offered by the drug over other conventional antibiotics are key driving factors for the Macrolide drugs market. In addition, low incidence of side-effects of the drug will further boost Macrolide drugs market size in the years ahead. A study stated that Macrolide drugs may increase the risk of a sudden cardiac arrest, ventricular tachyarrythmias, and cardiovascular deaths. In addition, consumption of the products can result in GI disturbances and inhibition of hepatic metabolism. This, in turn, may hinder the growth of Macrolide drugs market in the ensuing years. Regionally, North America has been leading the worldwide Macrolide drugs market and is anticipated to continue on the dominant position in the years to come, states the Macrolide drugs market study. Developed healthcare infrastructure, rising healthcare understanding & awareness about the drugs against the infections, increase in funding of healthcare activities, and rise in the research and development on the unexplored applications of Macrolide drugs are the key factors behind the dominance of the North America Macrolide drugs market. The high number of market players being headquartered in North America is another significant factor that is supporting the growth of this regional Macrolide drugs market. In addition, rise in number infectious diseases, majorly the skin infections has driven the Macrolide drugs market in this region.